remember YEARS AGO... when I very first started... running across Melissa Jill!!! She had a heart for others and she was wildly talented!!! I emailed her.... and told her I wanted to attend one of her workshops. But I wasn't ready to invest in my business.. If I'm being honest.. and I was scared. So my email became an empty promise. I kept following her throughout the years though -- she began her own album design company (Align) -- who I use for all of my album designs by the way!!! And she was the industry shaker who began using Associate Photographers! I know there are a lot of 'companies' who outsource weddings by hiring photographers -- but her way was so different! She had created a FAMILY. I loved that she created a group of photographers who her clients could grow to love and trust as well. 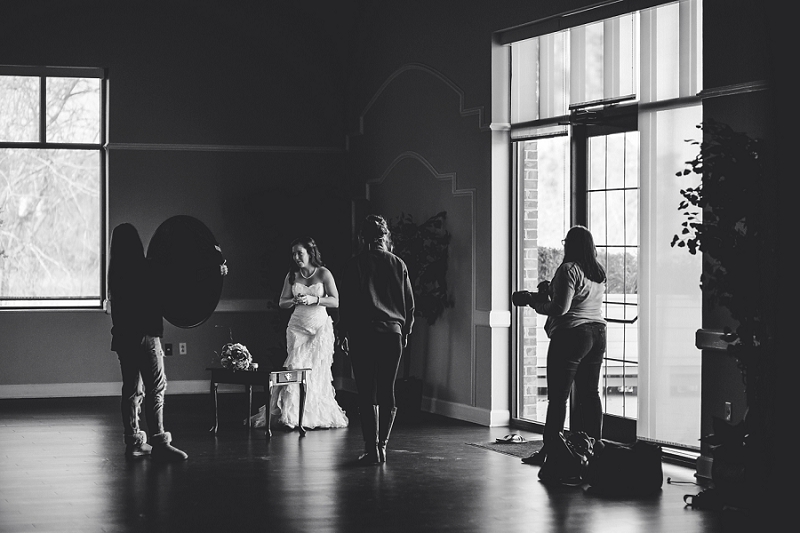 When I began shooting weddings -- I never had a desire to outsource for second shooters... From the beginning, even aside from being inspired by Melissa... I had a heart for wanting to grow a business family as well. My definition of success for my business has always been insanely 'simple'. I've never wanted to shoot 40 weddings a year myself -- even the thought of that gives me anxiety! There's a reason I quit my full time job four years ago... and it wasn't to work every weekend out of the year -- besides, being away from home that often gives me SO much anxiety... especially now that I have Ava! So in trying to figure out what I wanted out of my business... three years ago -- when I hired Ashley.... the idea of an Associate Photographer Program came to mind! In 2014 - with the coaching and push of my dear friends Mary + Justin -- we officially announced the program and we started booking weddings for Ashley in 2015. In 2015 - our goal was 10 weddings for the program... insanely enough -- we booked them. After turning away many weddings -- we realized that it was becoming really successful. We were able to reach a market that was PERFECT for us - but who may not have a huge photography budget OR wanted us on a date that I was already booked. The decision was made to promote one of our Second Shooters - Meghan... who began accepting weddings in 2015. We now have a growing and successful Associate Program -- with 20 weddings on the books for the girls this year already and a few already for 2017. 1. lessen the number of weddings I shoot so that I can take on more boudoir clients... up until this year, I've only ever been able to shoot boudoir in 'marathon' format... and I wanted more than that! so this year -- I have only accepted SIX weddings thus far! 2. help other photographers who HATE the back-end of wedding photography -- still get out there and shoot. I personally love handling timelines/planning and I'm a great communicator - so I'm always quick to respond. 3. reach MY market that i was quickly losing because MY rates were increasing... I'm NOT one of those business owners who think just because someone doesn't have a huge budget that they're not my bride -- I actually hate that mentality.... There are so many AMAZING SEP brides who value photography but aren't able to spend 6k on a wedding.... AND there are a ton of amazing SEP brides who get married on the SAME date. So, as I'm sure you can imagine -- this program has been the topic of conversation lately... Whenever I meet a new photographer, it's one of the first things I'm asked!!! In fact, I'm seeing an increase in the number of photographers who are taking on this same program within their own business! Now that I've given the background on how this program got started for ME -- I wanted to offer up a few tips for those of you starting your own program! 1. Create a brand that clients can trust. Before ANYTHING - you have to have a brand that clients can trust... if you are still in the beginning phase of your business - I'm not sure this is something that I could 100% recommend to you. I say that gently - because you haven't established a core foundation yet for your OWN business let alone one that would operate for Associate Photographers. 2. Have enough bookings. This is pretty self-explanatory... if you are getting 5-10 weddings a year yourself, you may not be ready to operate a program like this yet. You have to have enough bookings to sustain yourself AND other photographers. My max number of weddings for the past few years has been 25... and I was turning away a TON of weddings beyond what I had actually booked. This was something I considered very much before taking the leap with the program.... If I wasn't holding steady with the number of bookings WHILE increasing my rates -- I wouldn't have let this program take off when it did. 3. Hiring the right people. So you've knocked 1 and 2 off your list and now you're ready to hire. You need to take HIRING someone seriously. Years ago, when I first hired on second shooters -- I had a process. There were applications - and interviews... I took it SERIOUSLY. I have really (unfortunately) hurt some feelings of great photographers and aspiring photographers over the years by doing things this way... BUT... because I took things seriously... and asked questions most people wouldn't have asked in an interview.... I have a team that I can trust... when it's all said and done -- and after I'm done yelling at them....(ha.. but seriously. lol) I trust them to be kind to my brides... to honor the brand that I've spent years building. 4. Be willing to invest. Once you've hired the right people... you have to be willing to invest in them. I REQUIRE that before every wedding season -- new SEP members AND returning SEP members have to set aside days so that we can train together! We go over EVERYTHING -- I pour everything I know into them... we eat.. we laugh... we get mad at each other.. and we GROW. We are a family and investing yourself BACK into your business in this way will ONLY help it grow. 5. Acceptance. One of the HARDEST things in running an Associate Program (for me) -- has been accepting that this business has been built by me... it's my 'baby'... and we ALWAYS appreciate and work harder for things that we ourselves have worked hard at creating.... so with that -- I've had to accept that NO ONE I hire on will EVER feel the same way about SEP like I do... not even my own husband. I've had to adjust my expectations over the past couple years --- it's been one of the hardest parts of this business... learning to accept and adjust MYSELF in an honest way - so that we can continue to grow. 6. My girls may disagree with me here.... but be HONEST. If you are terrible at giving feedback... being honest... about your OWN business.. you will NOT be able to run a successful Associate Program.... That's a fact I will put money on. After EVERY event that I do -- I self-evaluate.... and after every event that my team and I do -- we debrief. It's mandatory... We talk about the day -- what we did that worked GREAT -- what we did that was TERRIBLE -- and what we can do better for next time. If you aren't able to evaluate ourselves and our business HONESTLY -- then you are not growing. My girls probably get tired of hearing my feedback.... BUT... they respect it and appreciate it.... even through tears and ego-checks... they are growing... WE are growing! If I said that every wedding I've ever shot -- I succeeded at... I would be lying... I take at least ONE THING away from every single wedding. I WANT to take something away from every single wedding. I don't ever want to get complacent! And in order to keep this program 'honest' - I have to do that for the girls too. When they fail -- I help them not fail the next time... When they succeed -- I help them succeed BETTER next time. 7. Create client trust. And lastly... you have to create a level of trust with your clients and incoming clients. They have to TRUST your associates. These NEW... SCARY... people that no one knows... so you have to help them create that 'bond' like they have with YOU. They are emailing YOU because it's YOU. I'll be honest... this part actually came pretty easy for me... I was TERRIFIED before we began this journey -- thinking about how this would actually happen.. but it's been pretty easy. Like I mentioned... I'm a great communicator -- AND I'm great at reading people!!! If for one second, I ever truly thought a new client would NOT get along with one of my Associates, I wouldn't hesitate on saying so and referring them out... THAT alone creates trust. Just being honest. Another thing that I've done that helps create trust is by letting my clients know that I'll be handling the back end of things.... we set up client meetings for the Associates and that helps build trust!!! And lastly... putting out work that clients can see. I will NEVER hire an associate who hasn't first worked with me as a second shooter... for the obvious reason... I want to trust them and work with them in that way first... BUT also so that when they DO get hired on as an associate -- we at least have a best of gallery to pass on to clients. Meghan started with me years ago as an Intern... and then an Assistant... and then a Second Shooter.. and now an Associate.... we were able to have a body of work to use to send to potential clients - so they could get an idea of her style... The more bookings you get for your Associates.. the more trust you'll be creating!!!! Another reason why promoting within your own team works really well at creating trust -- is that you've got a TON of clients who have ALREADY worked with them in one way or another and you can use those past clients as a reference! one of our 'stations' at a recent SEP training day!